The ultimate driving machine, my BMW, has been giving me second thoughts about continuing our ultimate long lasting love affair that we have shared. Just like any relationship, when it is good, it can be fabulous. But when it goes bad, you want to walk away, leaving the door wide open and never look back. There is nothing like the feel of the BMW jet engine when accelerating to pass another car, merge onto the freeway, or just kick it up a notch when you need an adrenaline rush. 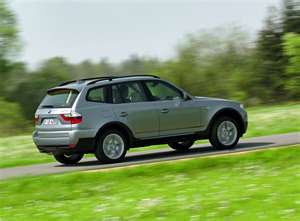 I know for sure that my BMW has saved me from several "almost" accidents by it's superb handling. But what is really starting to bother me is the money put out for the upkeep. I had resigned myself to dishing out the necessary $190 for an oil change (synthetic oil and all) even when witnessing my daughter write a check for a $37 oil change for her Honda. Many times I have considered trading my car in for an American or Japanese model to save on maintenance costs. But it is hard to part with an old friend, an old love. It is kind of like an old dog. Towards the end, it seems like all you do is clean up after them and pay expensive vet bills, but you owe them. They have served you well, been loyal, your true friend, so how can you turn your back on them now, when they seem to need you the most. I feel this way about my car, like it is a living, breathing creature, my savior at times. The latest hit to make a dent in the love of my car was a few weeks ago when I stopped to have my car washed. The attendant came up to me before it was entering the wash cycle, "Your sunroof doesn't close all the way". Okay, thanks, I'll have that checked out. Over to my mechanic, only to find out that he couldn't fix it and recommended I take it to the BMW dealership. 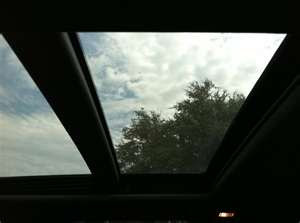 "The panoramic sunroofs are notorious for having problems. See if they can just close it for you. They can be very expensive to fix." And he was right. The BMW dealer couldn't close it, it had/has a broken cable and the estimate to fix it was $4,000. Yes, I will say that again, $4,000. And I have had more than one estimate. I could buy an entire little used car for that! So as it stands, the sunroof remains slightly opened and I am just hoping for an extremely dry winter this year. But no sooner had I made peace with leaving the sunroof ajar, when I was driving up I-80 to visit my friend Virginia, when out of nowhere (actually from the back of some idiots truck) a green backpack looking thing came flying at my car, and I hear a loud thump. I knew whatever I had hit made a little bit of an impact. I didn't know the extent of that impact until a few days later when I saw my coolant warning light on, swung by my trusty mechanics, only to find out that the water pump had been badly injured. Two days at the shop and $600 later, I was back on the road, happy to be in my ultimate driving machine, but feeling the burn of being burned. Hmm, anyone up for a Class Action lawsuit against BMW and their notoriously faulty panoramic sunroof? Hit me up if you're in.